IMPORTANT NOTICE: Back in February, our (old) web server crashed and several orders were lost. If you placed an order in February and have not yet received it, please contact us right away so that we can help. Bald Eagles are large birds of prey. They usually live near rivers, lakes and oceans so that they can fish and hunt for food. They can easily spot salmon, crabs, small birds and other animals from two kilometres away. How do you think they catch their food? This story is about going out to play even when it seems like the weather is bad. What things do you like to do when you are playing outside? Can you think of a time that you had fun even though the weather was bad? 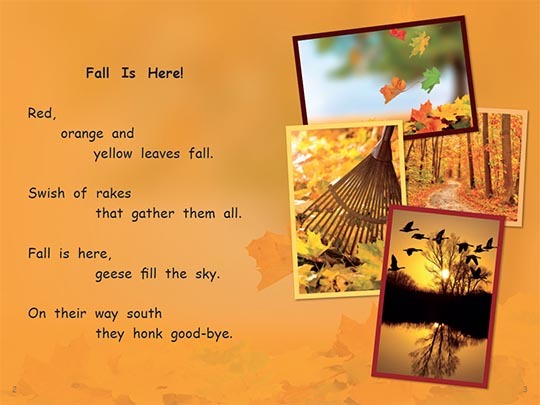 Deciduous trees drop their leaves every fall. This book teaches a little squirrel to count the leaves of 6 different deciduous trees. Do any of the trees in your neighbourhood lose their leaves in the fall?